A couple weeks ago, we had the interior walls and trim painted in our house– Benjamin Moore's Revere Pewter for the walls, and Behr's Polar Bear for the trim. We were totally thrilled with the results, but it was one of those projects that created more projects because the new stuff made the old stuff look worse. You know what I mean? 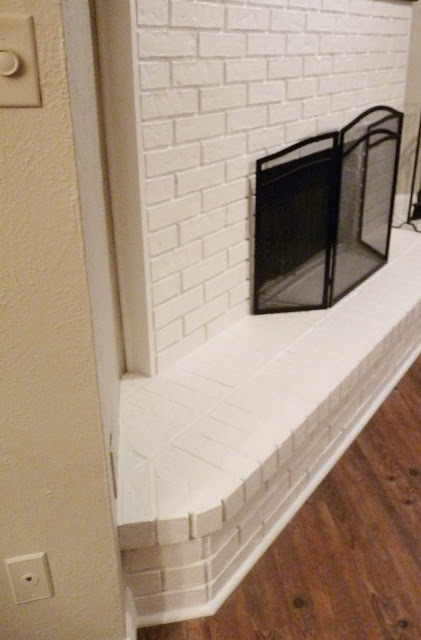 In this case, the great new paint colors made our old brick fireplace look even more dingy and blah than it already was. The fireplace needed a makeover! We haven't given this part of our house much attention since we moved in, except for adding the world's simplest $20 mantle. This weekend was all about giving the fireplace a much needed facelift. In an ideal world in which we have unlimited money to spruce up our house, we would just buy some fabulous natural stone and resurface the fireplace. Sadly, we live in the real world and we have a really small budget. 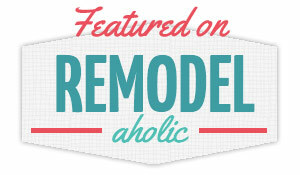 What do you do with an old brick fireplace when you have no money? You paint it! This is what the fireplace looked like before we started painting on Saturday. As you can see, we considered both white and a slightly darker shade of grey than the walls. 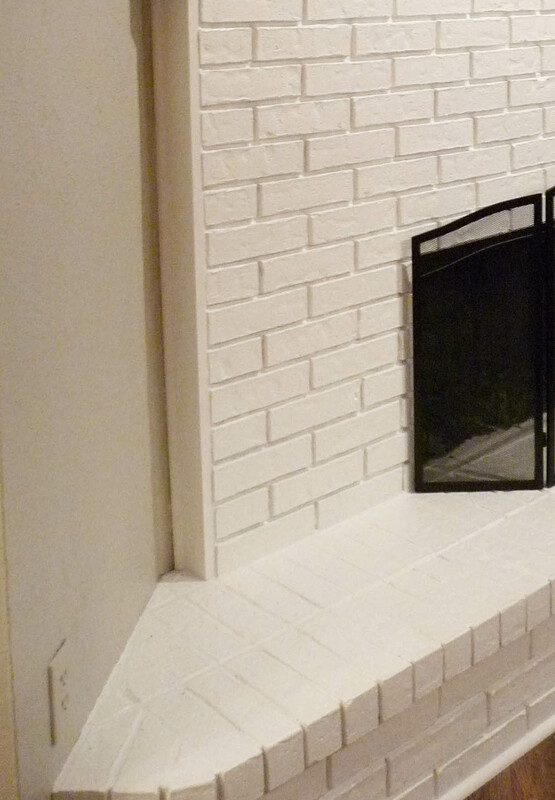 We ended up picking white because I wanted a fireplace that would allow the decorative accessories to really shine. I figured what could be better than a bright white background? See all those stains on the hearth? That was another good reason to paint it. The previous owners had spilled paint on the hearth, along with what looks like melted crayons. We wanted the white of the fireplace to match the trim color, so we went back to Home Depot and got another gallon of the trim paint (Polar Bear by Behr in a semigloss finish). This time we used latex paint instead of oil-based because we didn't want to deal with the smell of the oil paint. 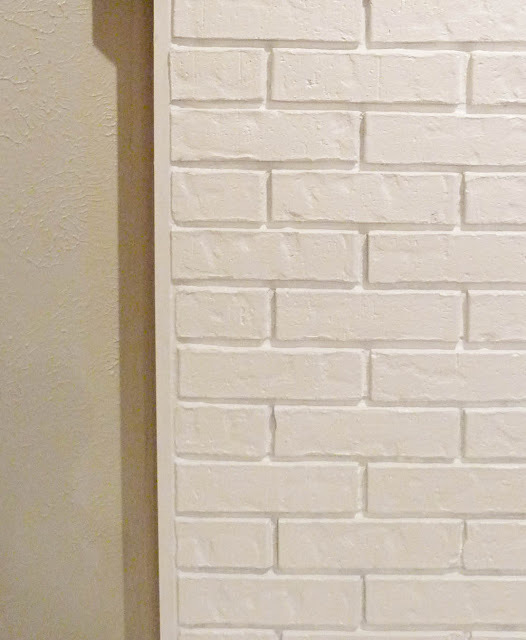 Painting brick is a little bit tedious. It didn't help that we had a lot of brick that had to be painted! I think it took us about 4-5 hours to completely finish it because it took a couple of coats to make that beige yuckiness go away. Painting the mortar was definitely a total pain– it absorbs paint like no other! Yuck, right? The only thing we can guess is that this brick might have taken up the whole wall in a previous life, and someone ripped it down and left the sides unfinished. This had been bothering us for awhile, so we headed to Home Depot to figure out a solution. After the hubby used a chisel to even out the surface, we used liquid nails and a nail gun to attach the new cabinet-grade pine 1x4 planks (I had already painted them white). Then he attached a piece of quarter round to finish it off. There were some gaps between the wooden frame and the bricks, so hubs used caulk to fill those in. The end result was super sharp and actually looked finished! The next little project was to finish off the edge between the brick hearth and the flooring. This wasn't a major flaw, but we weren't totally thrilled with the transition between the floor and fireplace, so we decided to finish it off with another piece of quarter round. The last step was to beef up the mantle. We wanted something a little bit more substantial to even out the proportions of the fireplace. Actually, that wasn't quite the last step. We also wanted to stain the mantle a darker color so it would coordinate with the touches of deep wood and black that we have throughout the living room. The husband bought a 1x4 cedar plank to match the existing cedar mantle, and then we built out a box to place below the mantle shelf. We used red mahogany stain to stain the natural cedar a very deep brown. Wow, it looked SO much better! Sorry about the difference in the lighting... We didn't finish it until late Sunday night, and the other picture was taken during morning light. So, what do you think of the new fireplace? We are really happy with it! I may or may not have tried hanging some of our Christmas stockings on it just to see how it would look. Haha! But seriously, I'm definitely an early Christmas decorator so you better believe I'm going to have a lot of fun with the new, blank-slate fireplace! Traveling Abroad– Got Any Tips? I Can't Believe I Missed it!! !